This example shows you how to use CAN message filters to allow only messages that contain specified identifiers to pass through a channel. It uses MathWorks Virtual CAN channels connected in a loopback configuration. One channel will transmit messages the other. Filters are set on the receiving channel. These messages are sent to the receiving channel multiple times throughout the example. Note that one of the messages has an extended identifier. Set the channels online, transmit the messages, and receive them. Note that all messages sent were received. The filter settings on a newly created channel are fully open for both standard and extended identifiers. Plot the identifiers of the received messages to see that all messages sent were received by the channel. Use the filterAllowOnly command to specify messages to receive by CAN identifier and identifier type. Display the channel to view the configured state of the message filters. Transmit the messages again to the receiving channel. Note that fewer messages were received this time. 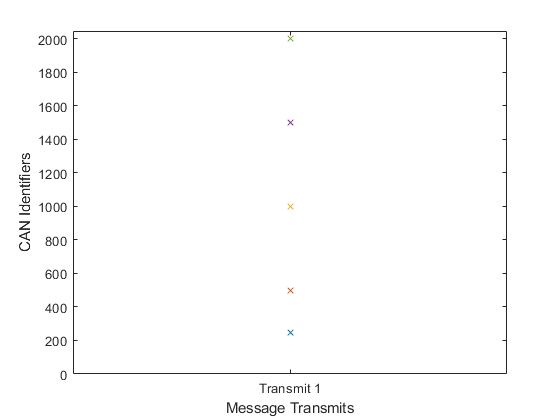 Add the new receive data to the plot to see which messages are blocked by the filter. The message with the extended identifier was numerically supposed to be blocked, but it passed the filter because the filter was only configured for standard identifiers. You can reset the message filters to their default open state with the filterAllowAll command. Transmit and receive a third time to see that all messages are once again passing through the filter and into the channel. 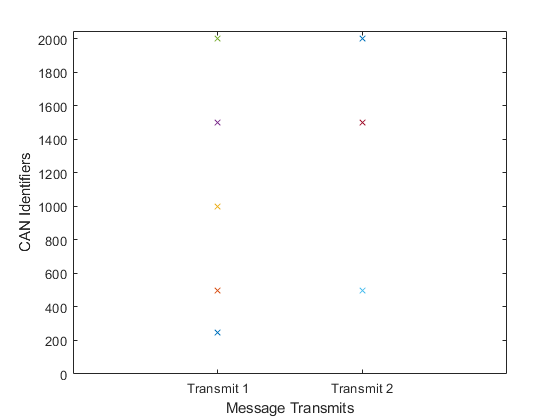 With the new data added to the plot, observe that the first and third transmits are identical as the message filters were fully open in both cases. The filterAllowOnly command can also reference messages by name when using a CAN database file. The filterBlockAll command lets you quickly set the filter to block all messages of either standard or extended identifier type.